There was no Knicks game last night. But the Knicks—the doomed, imploding Knicks—are today's big sports news in New York, even if Carmelo Anthony hasn't really requested a trade, even if Mike D'Antoni is secure in his coaching job*, even if the last game the team played was a tight road loss in Chicago, where the home team ran its record to 17-3. The Knicks have lost a lot recently, six games in a row. This has upset the folks who were plotting championship parade routes after the dawn of Linsanity in February, with an injured Anthony watching the Knicks' seven-game winning streak from the bench. As soon as the superstar returned to the lineup, the Knicks turned awful again. Someone is to blame. Never mind that the days of Linsanity featured a lot of narrow wins, against bad teams. Of the Knicks' foes in that stretch, only the Lakers and the Mavs are currently in playoff position. Since Anthony's return, the Knicks have mostly faced a string of playoff-bound teams, like the Bulls, Heat, and Sixers. Their fortunes dipped accordingly. But what should be disappointment with a struggling team—if not hope that the Knicks will bounce back—has become hysteria. Consider this paragraph in Chris Broussard's story for ESPN.com, "Sources: Knicks tuning out coach." With Anthony sapping the energy from the offense, the players often lose their incentive to play defense. But even when he's trying to play defense, Amare Stoudemire struggles. Having spent almost his entire career in D'Antoni's non-defensive system, Stoudemire has trouble making defensive reads and rotations. 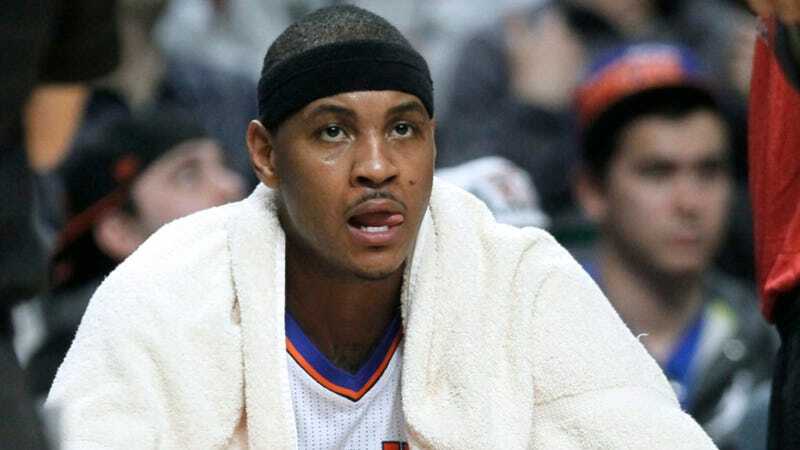 Anthony knows what to do defensively, but simply refuses to do it consistently, the sources said. The logic of Broussard's sources is more out of joint than the Knicks' half-court offense. Work through the argument here: Mike D'Antoni doesn't care about defense. But Amar'e Stoudemire can't execute Mike D'Antoni's defense, because he's too familiar with playing in D'Antoni's defensive system, which is non-defensive. Carmelo Anthony, meanwhile, refuses to play defense, which proves that he can't coexist with his coach (who doesn't care about defense). And the rest of the team, because Carmelo takes bad shots on the other end, refuses to play the defense that Mike D'Antoni doesn't coach. The result, in this high-variance shortened season, is that the Knicks can't weather a simple losing streak without a media storm whirling around their star player and coach. Last month, Denver lost five in a row and later in the month lost five of six. The Clippers are 4-8 in their last 12. The Pacers had losing streaks of four and five games. No one threatened to blow those teams up, and no one demanded it, either. But on the Knicks, after less than a month of a healthy Melo playing alongside Jeremy Lin—whose assist-to-turnover ratio, by the way, is 42nd among NBA point guards—against tough teams, primarily on the road, it's apparent to all that someone must go. That this thing, which had yet to work all that well in the first place, is cursed to never, ever work, because someone simply isn't willing to put in the emotional or attitudinal effort to make it work. The Knicks play again tonight, at home against Portland, and they'll probably win, because the Blazers are 20-22 and have struggled on their eastward swing. And then we can start a new cycle all over again. *Apparently D'Antoni didn't care for such security. The news of his resignation broke shortly after we published.